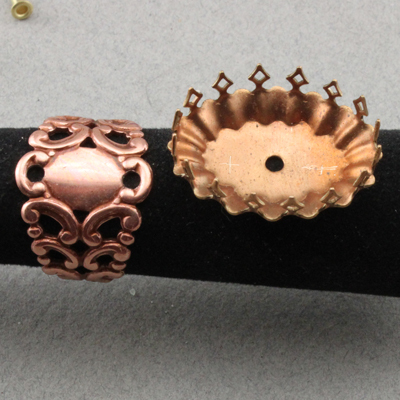 Rings are easy to make in 5 minutes. 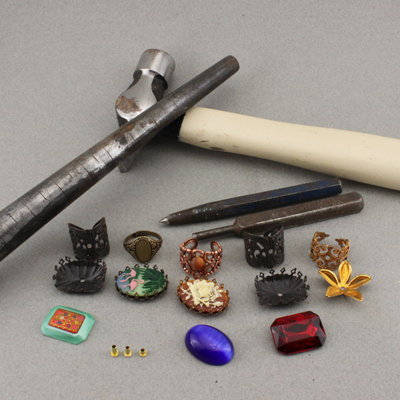 Materials to use include your favorite ring shank, a setting or mount and a jewel. Additionally E-6000 or similar glue if you don’t want to rivet. 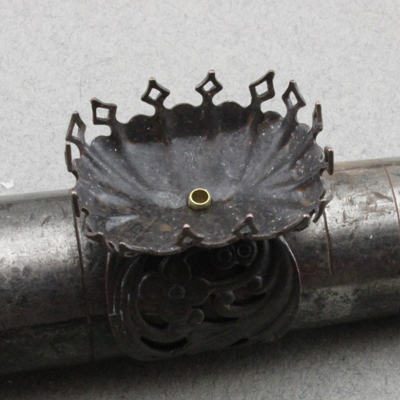 Let’s start with a nice rusty black floral shank and a matching crown mount. 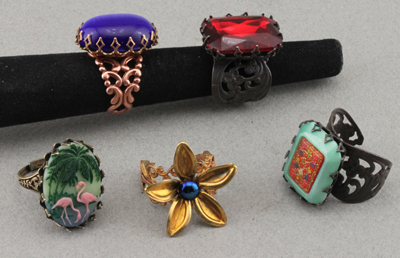 The 25mmx18mm focal is Czech glass. 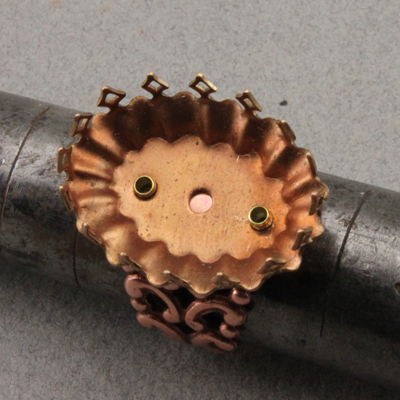 First step is to drill or punch a 3/32 hole in the top of the shank and insert the eyelet/rivet. It should protrude only the length of its diameter…just enough to allow the formation of the rim. Set the shank with the rivet sticking up through the shank onto the mandrel. 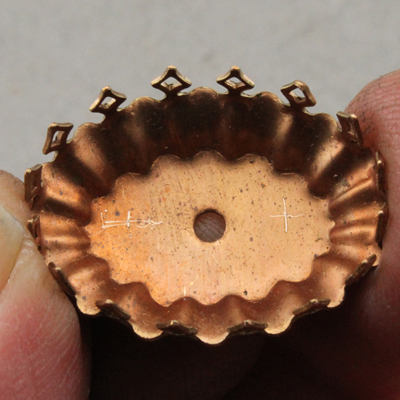 Place the crown mount over the rivet. 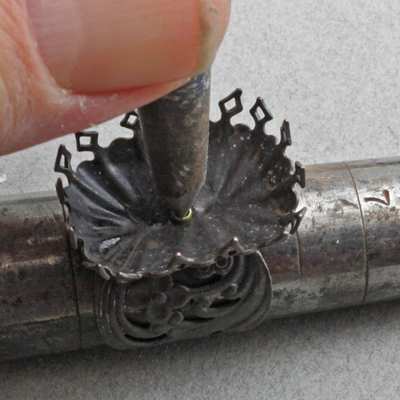 Using a center punch to spread the tube of the rivet is easy. Just set it into the open end and hit the punch with the hammer a few times. The finished rivet should be tight to the bottom of the mounting. 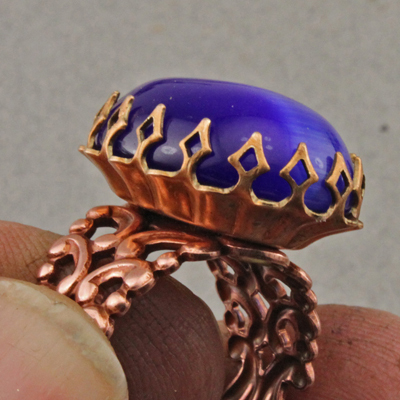 Set the stone into the mounting and carefully press the prongs over the edge of the stone. 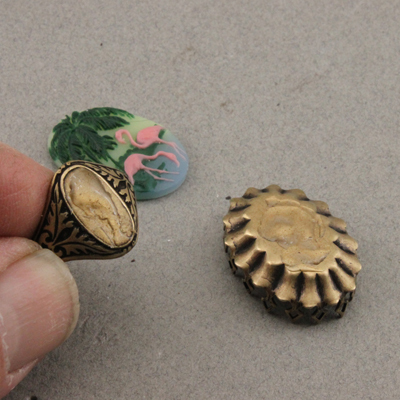 The next fast ring involves the cigar band ring and an oval crown mount. Because the oval is long I like to add a second rivet and the cigar band shank has two holes that can be enlarged to fit the 3/32 size. You can measure carefully to mark the locations…or do it the professional way with a pair of dividers. Put the points into the two drilled out holes and adjust the divider points to the center of each hole. 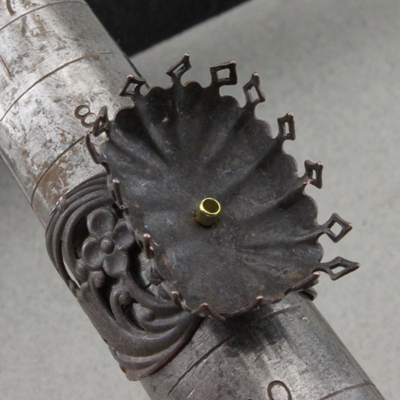 Place the dividers into the crown mount and scratch a mark with both points. 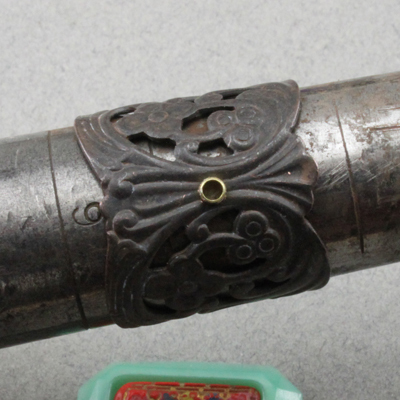 The marks need only to be visible enough to drill or punch through. 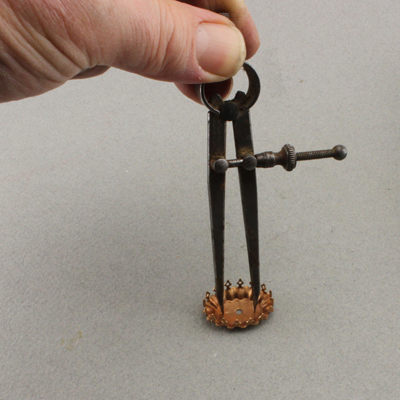 Once again put the rivets through the shank and slip the mandrel inside the shank to hold them in. Set the rivets and you are ready to mount the stone. 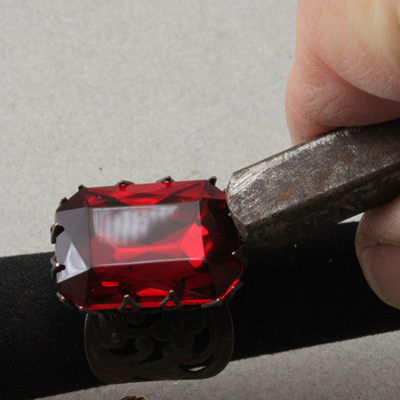 Again make sure the stone fits evenly in the bottom of the mount and fold the prongs over. 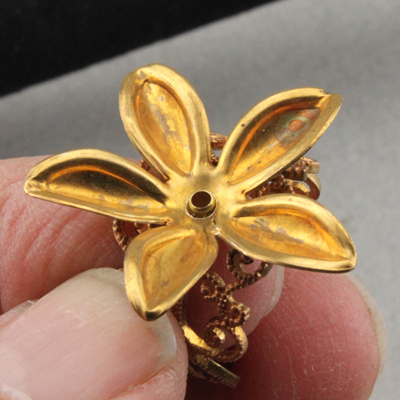 Ring three is using the with http://www.bsueboutiques.com/item/Pierced-Floral-Vintage-Style-Ring-Base-Shank-8533 with an 18x25mm http://www.bsueboutiques.com/item/25x18-Rusty-Black-Patina-Crown-Mount-Pronged-8562 . 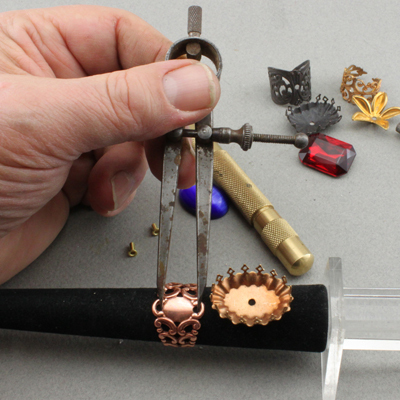 Follow the same routine when setting the rivet. 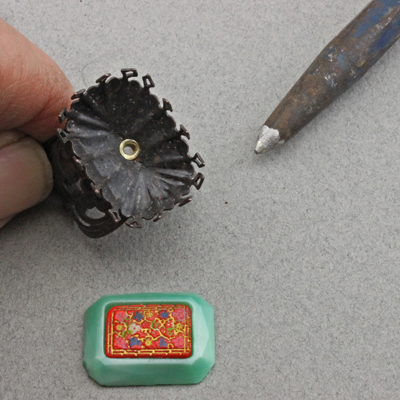 Level the stone and push the prongs over the edge of the stone using a tool to make it easier. One of my favorites is the end of the punch. Another that works very well is a piece of wood dowel or a wood clothes pin. 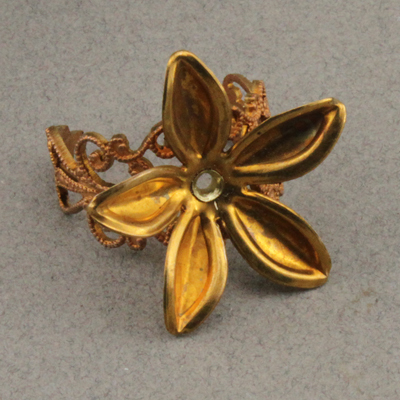 Ring 4 uses the http://www.bsueboutiques.com/item/Filigree-Ring-8086 and a flower in gold colored brass. Drill or punch and set the rivet. 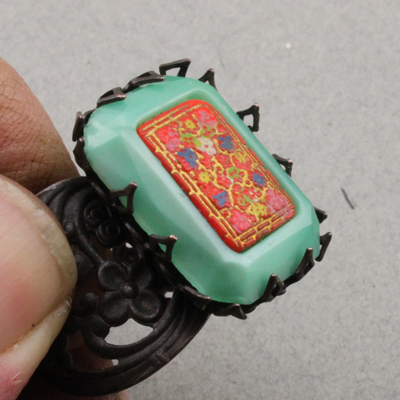 I used E 6000 glue to set a glass cab to cover the rivet. 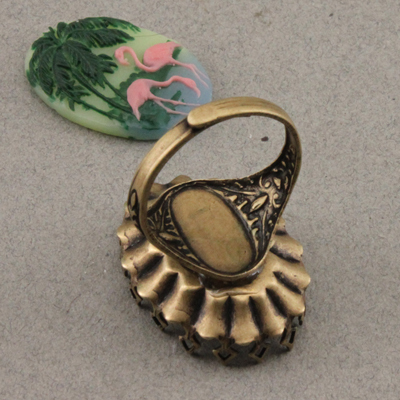 This last ring is for those who would rather use glue. 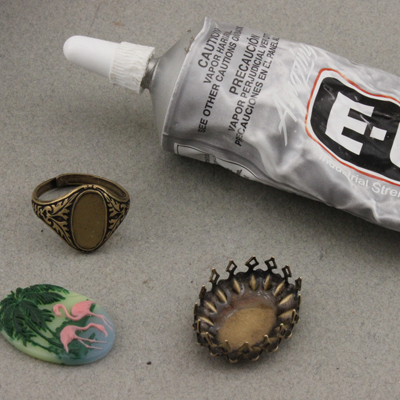 Pick a bezel to match your focal and apply E 6000 glue to both pieces. Let it set for a minute the push the 2 flats together. Position the two pieces and allow the glue to set. And again set the focal. 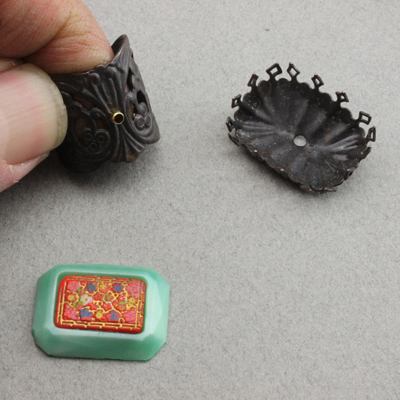 In this case I used another prong mount but a low wall bezel will work the same. 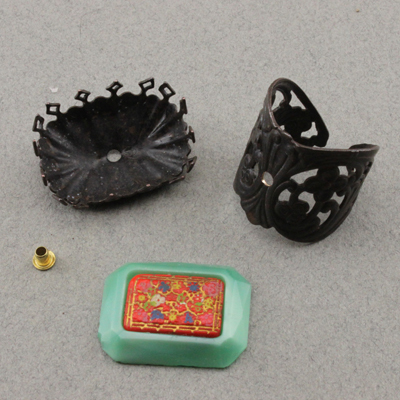 Think about all the easily made rings you can do any ring you dream up will work; how about a flat bottom bezel with watch parts and Ice Resin? Once you conquer this technique your imagination is the only limit.